A pristine wilderness of stunning scenery, a vibrant and enchanting local culture and Gross National Happiness await those who are prepared to make the journey to the last real Shangri-La. The Tourism council of Bhutan has created a comprehensive website for those wanting to know all there is to know about Bhutan and a handy Events Calendar, so start planning. UPDATE: Bhutan now has a second airport in the Bumthang Valley in Central Bhutan with flights operating 3 days per week. This allows greater flexibility in designing the perfect itinerary as you can drive one way and then fly back to Paro if you are short of time. Additionally there are 3 overland border entries to choose from and new routes with Druk Air to Singapore, and Bagdogra. TAILOR-MADE TRAVEL YEAR ROUND – if 3 people travel together – a group rate applies! Our tailor-made tours are designed to visit the most culturally significant locations in Bhutan, most often incorporating a Tshechu (festival), which is one of the ‘not to be missed’ attractions of this deeply spiritual and traditional country. Travel at a leisurely pace not offered by off the shelf group tours. Sample itineraries can be viewed in the drop down list. Mix and match the cultural with the energetic with day or overnight walking, fully supported by our trek teams. Our walks range from relatively easy to those for the dedicated trekker – wilderness trekking at its best. All out tours can be tailor made for individuals, couples and small groups. FESTIVALS IN BHUTAN: We can tailor make your trip to coincide with any major festival, a highlight of any journey to Bhutan. Days of frenetic and colourful dancing offering a unique opportunity to be part of the fabric of Bhutanese life. September and October are great months to visit when the Autumn colours tinge the forests and the weather is perfect. There are six major festivals from mid September to late October. REMINDER: Travel on Q continues to offer tailor-made itineraries year round for individuals, couples and small groups. We cater to individual interests and requests and can combine the luxury Aman, Taj and Como properties with our fully supported camping and Bhutanese lodges. We offer expert advice and totally customised arrangements. Travel on Q is currently one of the only Australian agents organising individual travel into Bhutan, by virtue of our knowledge of the country and contacts with one of the larger local operators. We are also able to organise personalised small group tours. We can show you Bhutan in a way that no-one else can. Visitor numbers are strictly controlled and a trip can only be organised through an officially appointed operator. Our suggested itineraries have been designed to incorporate the important festivals throughout the year. However we can design an itinerary to suit your requirements. We use A class hotels wherever possible and can also incorporate the luxury Aman properties, of which there are now four and also the Uma Paro into our itineraries. Prices are quoted ex Bangkok and are based on the US dollar and therefore subject to change. Bhutan, landlocked between India, Tibet and China is a beautiful and mainly mountainous country (roughly the size of Switzerland), bisected with steep gorges and fast flowing glacial rivers. Its population of 600,000 is mainly agrarian and the landscape is dotted with traditional painted wood houses, and fantastically crafted rice paddies plunging into the deepest of valleys. Houses hang off impossibly steep hills and seem to be suspended in space. Many people have never ventured beyond their own valleys, so there are a multitude of ethnic groups, with their own local dialects and dress customs. Dzongkha, the language of the western region, is the national language. English is the medium of instruction and is spoken by all government officials and businessmen. The children in particular, understand English as most subjects are taught with English texts. Most signs are in both languages. Nepali is prevalent in the south, while Bumthangkha, Khyengkha and Sharchopkha are common dialects. The country can be divided into three major geographic regions, from north to south: the high Himalayas of the north, the hills and valleys of the centre, and the foothills of the south. Rivers play an important role in the landscape and their enormous potential for hydroelectric power has helped shape the economy. Flowing south, they have created deep valleys making east-west travel arduous. The climate differs widely across the country because of the variations in elevations and seasons. Southern Bhutan has a tropical climate with hot humid monsoons. Spring in the higher valleys (mid-March to May) has warm days (20C) and cool nights. June marks the beginning of summer when day temperatures warm up to 27 – 29 C. By July, the rainy season starts and continues until mid-September. The autumn months of September to November are ideal for trekking with clear skies and mild weather. In December temperatures fall, but the days are warm and the clear bright winter skies serve as a striking background to the snow-capped peaks. On a sunny day, temperatures reach about 16-18 C.
Bhutan has an ancient culture with a strong Tibetan influence and traditions have remained unchanged for centuries. The Bhutanese are very friendly, not camera shy and often speak some English. Because of the isolation of many communities, there are many different dialects, dress codes and customs which makes a visit all the more fascinating. A benevolent and forward thinking Monarchy is determined to maintain these long held traditions and also offer its people free education and health services. National dress and a national code of building are enshrined in the Constitution and traditional practices are encouraged wherever possible. Bhutanese national dress is the kira for the women and the gho for the men. The kira is one long woven textile, often made of three panels, which the women wind around their bodies. It is held together at the shoulders with beautiful silver clasps, which are often family heirlooms and at the waist by a woven belt. A close fitting short silk jacket is worn on top and for special occasions another woven textile is worn over one shoulder. The gho is rather like a dressing gown (often in a plaid pattern), secured by a belt at the hips and worn over a white shirt with very long cuffs, which turn back over the sleeves of the gho. All men also have a ceremonial shawl which must be worn over the gho when entering public buildings. The colour of the shawl indicates rank (most men have a white shawl). This ensemble is completed with knee length socks and black shoes. People can wear western dress after 6pm if they wish. Bhutanese textiles are particularly beautiful and of infinite variety. All are hand woven on village looms and it can take many months to weave just one kira. Bhutan is the only country in the world to retain the Vajrayana form of Mahayana Buddhism as its religion. The Buddhist faith has played a fundamental role in the cultural, ethical and sociological development of Bhutan and its people. In the Buddhist tradition, the hills are dotted with clusters of multi coloured prayer flags sending continuous prayers to the heavens. The Bhutanese believe that every flutter of the printed flags sends another divine message and gives grace to the sender. Everywhere you will see chortens and stupas, small water driven prayer wheels and massive golden roofed dzongs, which serve as both the spiritual and administrative centres for the whole country. 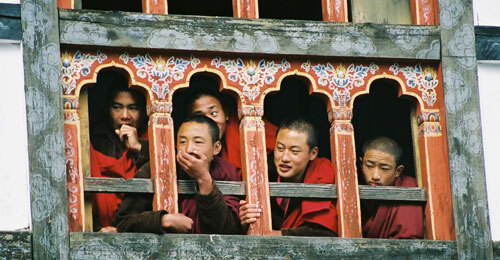 Bhutan offers visitors a range of cultural experiences. Entry to dzongs, monastries, schools and other cultural institutions is permitted at certain times. The staple foods are rice and potatoes and maize with chicken and all kinds of meat and a wide variety of vegetables. Bhutanese also add chilli and yak or cow cheese to virtually everything. For Westerners, meals are mainly served in Lodges and Guest Houses as there are few restaurants outside the capital of Thimpu. Local and Indian beers are available and there are also local and imported spirits. Wine is scarce and expensive. Bottled water is readily available. There are many colourful festivals (tsechu, drupchen & dromchoes) at various times of the year, which are a highlight of the Bhutanese calendar. Festivals are very important to the Bhutanese, as they perform both a religious and social function, gathering together people from all over the country. The dzongs come to life with colour, music and dancing as everyone dresses in their best clothes and joins together to witness the dances. 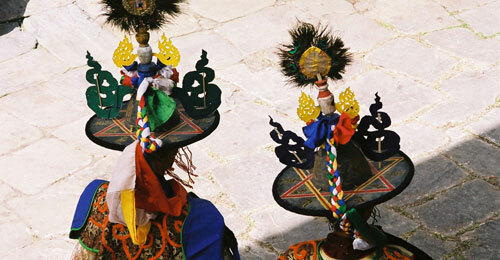 Rare masked and sword dances and other exorcism rituals are performed in the dzong’s courtyard. 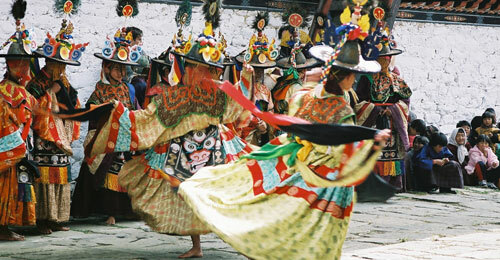 Each dance has its own significance and can be performed by monks or lay village leaders dressed in bright traditional costumes. There are also markets and traditional games such as archery (the national sport), darts and gambling. There is also ample opportunity to walk and/or trek in this pristine environment. Walking ranges from day walks to 3 day walks in the Bumthang and Probjikha and Haa valleys. Longer treks include the 7 day Jomalhari trek and the 30 day Snowman Trek (reputedly the hardest trek in the world). The longer treks offer stunning views of the Himalayan range and all walks and treks are supported with guides, ponies, a cook and all the required camping equipment. Altitude sickness is not a problem on most ot the walks. Bhutan’s early history is shrouded in the mists of Buddhist tradition and mythology. As most important events of the period involved saints and religious leaders, they were therefore chronicled only in scriptures. Unfortunately, due to natural calamities like earthquake and fire, most of these original documents were destroyed and much of this early history relies on reports from British explorers, and on legend and folklore. Archaeological evidence suggests Bhutan was inhabited as early as 1500 BC or possibly even 2000 BC. These early inhabitants were followers of Bon, an animistic tradition that was the main religion of the Himalayan region before the advent of Buddhism. Though Buddhism was introduced as early as the 2nd century, the first Buddhist temples were built only in the 7th century during the reign of the Tibetan king Songtsen Gampo and it was during this era that the influence of Tibet began to spread to Bhutan. However it was only with the first visit of Padma Sambhava or Guru Rinpoch to Bhutan in the 8th century that Buddhism was truly introduced to Bhutan. Between the 9th and 17th centuries numerous ruling clans and noble families of Tibet settled in different valleys throughout Bhutan following internecine strife in Tibet. It was during this period that the Bhutanese variety of Buddhism, the Drukpa Kagyup, established itself in Bhutan after escaping persecution at the hands of the Gelugpas. By the 16th century, the country was fragmented between many local chiefs. The arrival of the Shabrung Ngawang Namgyal (1594-1651) brought an end through bitter struggle to this division. During his reign, many dzongs and monasteries were constructed. He devised many of Bhutan’s customs, traditions and ceremonies to forge a unique cultural identity distinct from Tibet. Following the Shabrung’s demise, which was kept secret for more than 50 years, the country fell apart in the throes of civil war. This fractious state of affairs continued for centuries till the modern period was initiated at the onset of the 20th century with the instalment of the Trongsa Penlop as the first hereditary monarch of Bhutan. Bhutan retains its monarchy, but now has a democratically elected government.